Donald L. Miller does not work for, consult, own shares in or receive funding from any company or organization that would benefit from this article, and has disclosed no relevant affiliations beyond their academic appointment. Good historians know that history rarely teaches clear lessons. When it does, we should heed them. In the 1920s, urban visionaries completely refashioned midtown Manhattan, making it the most modern and economically vibrant downtown in the world. Their work can serve as an inspiration and example for businessmen, city officials, and residents who are currently struggling to find ways to keep midtown – now an aging business district – the center of world capitalism, without destroying its historic character or creating impossible pedestrian and vehicular congestion. So far, leaders of the 21st century campaign to remake Manhattan have paid little heed to what urban critic Lewis Mumford called “usable history.” In 2013, Mayor Michael Bloomberg unveiled a sweeping plan to rezone a 73-block area surrounding Grand Central Terminal, which would allow for the construction of super-size skyscrapers, some of them taller than the Chrysler Building. This would make New York more competitive with Hong Kong, Shanghai, and London in the fiercely contested battle to attract and retain businesses with global reach, Bloomberg argued. Opposition from New York’s City Council and community leaders forced Bloomberg to withdraw his plan. They argued that it would increase already intolerable congestion in the area and that it failed to provide sufficient funding for transit improvements to handle the massive increase in commuter traffic generated by a surge of new skyscraper development. But the rezoning issue isn’t dead. Mayor Bill de Blasio has promised to introduce a comprehensive proposal of his own. In September his administration unveiled one part of it: an agreement between the city and developer SL Green Reality Corporation that would permit the developer to build a tremendous skyscraper one block west of Grand Central Terminal. Designed by Kohn Pedersen Fox Associates, the new office behemoth – One Vanderbilt – would occupy an entire city block. At 1,450 feet, it would be the second tallest building in New York City, behind One World Trade Center. For this municipal dispensation to scrape the sky, SL Green had to promise $210 million in transit improvements. Before construction can begin, however, the plan must pass through a labyrinthine municipal land-use review process. If approved, the promised transit updates must be finished before January 2020, the anticipated completion date. In the interim, as the new mayor and his planners fashion their much broader midtown rezoning plan, New Yorkers should be attentive to their own history. Nearly a century ago, in the 1920s, audacious developers, architects, and city officials built the world’s first twentieth century downtown around Grand Central Terminal. And they did it right, merging skyscraper development of unprecedented scale with transit projects to swiftly move pedestrians and vehicles. They built high without creating paralyzing congestion below. It was one of the boldest private construction projects in the history of cities, and its anchor institution was the new Grand Central Terminal, completed in 1913. Compelled by the state legislature to electrify its steam trains, the New York Central Railroad buried them, eliminating a blighted, fourteen block marshaling yard north of the terminal that pedestrians were forced to traverse on iron catwalks, braving swirling smoke and hot ash. On the roof of Grand Central’s new smokeless tunnel, the railroad built Park Avenue – “straight as a sunbeam,” in Zelda Fitzgerald’s words. The new Parisian-like boulevard was flanked by high-rise apartments of restrained design: the world’s first skyscrapers built for permanent living. Working from the plans of chief engineer William J. Wilgus, the railroad sold “air rights” to private developers of the large lots it owned around the Terminal. With “revenue plucked from the air,” the state-of-the-art transportation complex was completed on time and under budget. Many of the residents of the new Park Avenue were migrants from Fifth Avenue. In the 1920s, descendants of Cornelius Vanderbilt, the Commodore, sold their cheerless chateaus to a new breed of Jewish real estate tycoons who razed them and built commercial space for merchandising impresarios. They, in turn, transformed Fifth Avenue, from 42nd Street to Central Park – an area once called Vanderbilt Alley – into the most exclusive shopping district in the world. And on a rocky bluff at the eastern end of 42nd Street, real estate kingpin Fred French built Tudor City, a park-like skyscraper community for mid-Manhattan office workers. Only a five-minute walk from Grand Central Terminal, it remains an overlooked model of affordable in-town living, the kind of middle-range living quarters midtown requires today to draw and retain the young, cyberspace entrepreneurs it needs to remain as hip and fully alive as Chelsea and Hudson Yards. In the 1928, Walter Percy Chrysler, a former railroad mechanic from the Kansas plains, began developing plans for the silver-capped symbol of the auto age he helped usher in. That same year, directly across 42nd Street from the Terminal, real estate developer Irwin Chanin was completing the fifty-six-story skyscraper that still bears his name. These “setbacks” let in light and air that prevented many of the city’s streets from becoming dark, suffocating corridors. Architectural adjustments along these lines should be a sin qua non of the new midtown that Mayor de Blasio’s planners are envisioning. The midtown of the 1920s had the density and diversity that make cities lively and livable. But to prevent density from devolving into paralyzing congestion, it must be married to movement, the swift dispatch of people and goods. 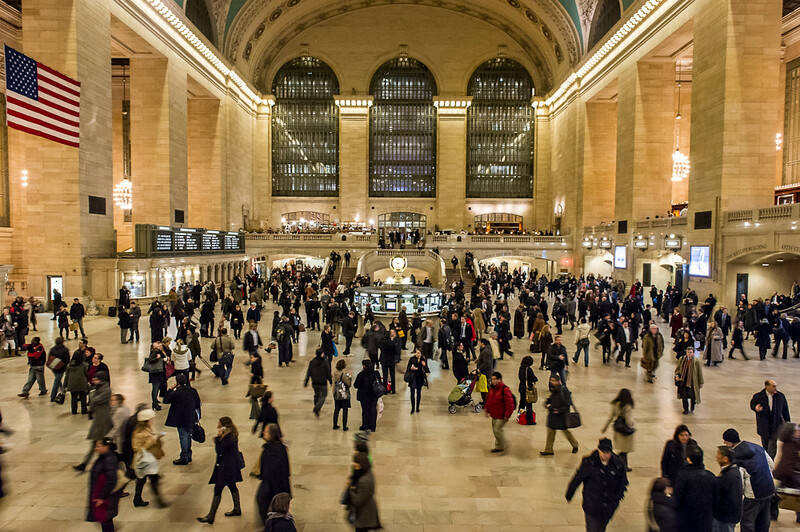 With its pedestrian ramps and shop-lined underground passageways that connected it to nearby buildings and transit platforms, Grand Central Terminal became the world’s greatest people moving machine. Unaccompanied by ambitious transit improvements, a skyscraper revolution on the east side of midtown is a formula for urban paralysis. Reopening and upgrading passageways that have been boarded up for decades would create a greatly needed circulation network in the world’s largest central business district. This, too, must be on Mayor de Blasio’s midtown agenda. Completing the Second Avenue Subway Line, first proposed in 1929 during Mayor Jimmy Walker’s administration, would also be essential. When completed it is projected to handle over half a million riders daily. The New York of the 1920s was built by men who were either born in Gotham or arrived from elsewhere to plant their flag and remake midtown’s commerce and culture: David Sarnoff in radio; Horace Liveright in book publishing, Samuel “Roxy” Rothafel in movies, Duke Ellington in music. “It is the person who was born somewhere else and came to New York in quest of something that accounts for New York’s high strung disposition, its poetical deportment, its dedication to the arts, and its incomparable achievement,” wrote New Yorker columnist E. B. White. These blazingly ambitious outsiders from west of the Hudson and east of the Danube bear scant resemblance to the footloose financial mandarins who are driving the current campaign to turn midtown into Hong Kong on the Hudson. For them, New York is a place to park their capital, but rarely themselves, in cloud houses eighty and more stories high, cut off from the messy vitality of the streets below. As currently demonstrated in the revitalized Chelsea neighborhood, the new breed of venture capitalists in the high tech and media industries are drawn to neighborhoods built to human scale, not to soulless skyscraper districts. Midtown’s skyline is a thrilling, ever changing phenomenon, and is currently being transformed by a spate of super-tall, super-slender, super-luxury condos. East Midtown – where scores of buildings are over seventy years old – needs modern business towers as alluring and efficiently designed as its new residential towers. But buildings worth saving should be refurbished and given new purpose, preservation being “a better stimulant for development than rezoning,” as architect Robert A. M. Stern argues. After being designated historic districts, the once decrepit SoHo and Flatiron neighborhoods were rejuvenated. And why rezone 73 blocks of Midtown, as Mr. Bloomberg proposed, when decisions about what to build and how to build can be made on a project-by-project basis, with community input? Whatever the outcome of the zoning debate, East Midtown will be updated and remain a world-class commercial district. A century ago, New York was a city so spontaneously alive it contained the seeds of its own regeneration. It has not lost that capacity for reinvention. The template for Midtown’s revitalization, however, should be its own history and heritage, not Shanghai or Singapore.